The Fauves first exhibited together in 1905 in Paris. They found their name when a critic pointed to a renaissance-like sculpture in the middle of the same gallery as the exhibition and exclaimed derisively 'Donatello au milieu des fauves!' ('Donatello among the wild beasts!'). The name caught on, and was gleefully accepted by the artists themselves. The movement was subjected to more mockery and abuse as it developed, but began to gain respect when major art buyers, such as Gertrude Stein, took an interest. 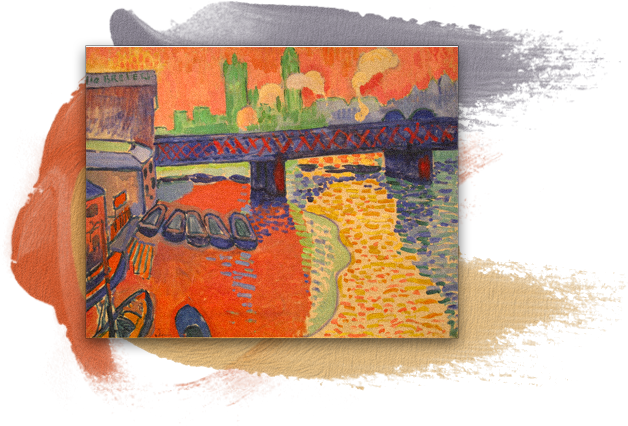 The leading artists involved were Henri Matisse, Rouault, Andre Derain, Vlaminck,Georges Braque and Raoul Dufy. 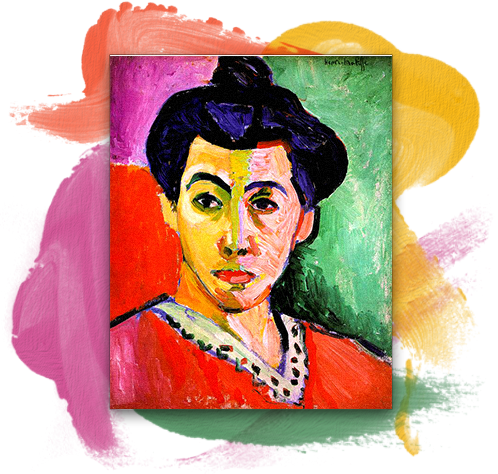 Although short-lived (1905-8), Fauvism was extremely influential in the evolution of 20th century art. 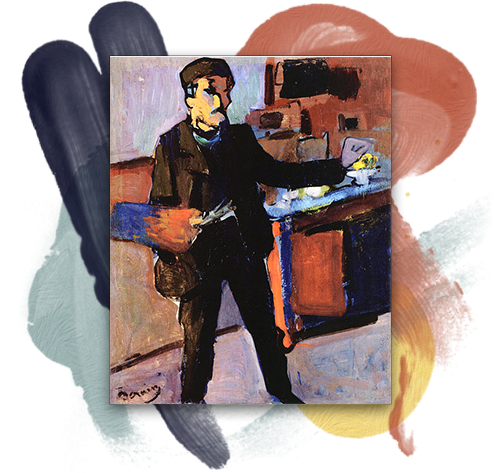 The first characteristic a viewer will notice on fauvist works is the intense colours used throughout the painting, which is what scared the audience back in 1905. Fauvists used pure and unblended colours in a way that has nothing to do with how the human eye views an object, person or a landscape. As Sabine Rewald from the Metropolitan Museum of Art puts it, fauvists' colours came "directly from the tube." The already "wild" colours were also intensified with the use of thick daubs and smears. Another deviation from the predominant movement of the late 19th century, impressionism, was the absence of small and thin brush strokes. Instead, fauve art paintings are dominated by bold, undisguised brushstrokes. 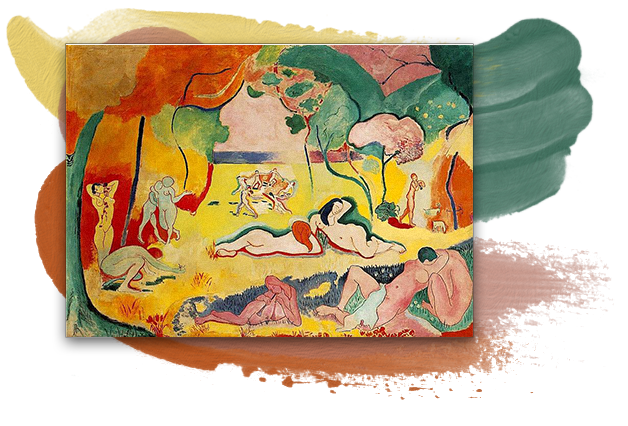 Therefore, if one pays attention to a fauvist painting, he can clearly see the strokes painters used to apply colour to the painting. As a result, transition between adjacent colours is quite abrupt, as it is evident on Andre Derain's portrait of Henri Matisse from 1905. 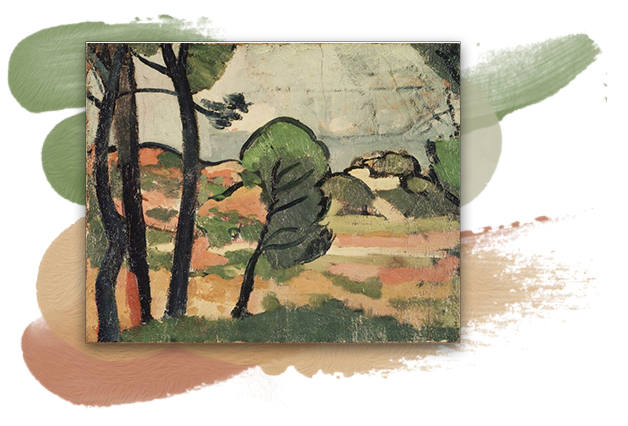 Disregard of three-dimensionality does not refer to disregard of perspective, as fauvist painters made use of the technique to depict depth in objects and landscapes. Instead, the issues that weakened the perception of depth on fauvist paintings were the seemingly autonomous bold strokes and the lack of subtle shading. This characteristic derives from the fact that fauvists' priority was not the accurate representation of a surface's appearance. As described above, contrary to impressionism, realism was not in the agenda of fauvist artists. Instead, as the Art Story Foundation suggests, fauvists used unnatural colour combinations in their works to elicit a variety of emotional responses. Therefore, the use of colour did not abide by any laws, but it was more a way for fauvists to depict their own emotions on the canvas. In this respect, Tate suggests that fauve art can also be seen as a form of expressionism. This is a repost of an article i had written a while ago. It was deleted by mistake, sorry for that! You're damn awesome, brilliant work! Haha :') Well, you helped me a lot Thanks! I'm fine dear, Hope you're well too mwahs! I already wrote about Futurism a long time ago! Incredible, beautiful, and great information! I didn't even know what this style was called! Art History: Greek TragedyWhat is "Tragedy"? Tragedy is a genre most people are familiar with. Hamlet is a tragedy. Movies labelled as ‘tear jerkers’ are often tragedies. If you pare it down enough, it can be as simple as 'a story where a lot of bad things happen to the protagonist'. This would fit almost every tragedy ever written, but it's not very helpful for understanding the complexities of the genre, or what it contributes to storytelling. There are almost countless sub-genres of tragedy, and every one has specific rules and tendencies that further define it from 'tragedy' as a whole. This is a construct of ages of evolution in the genre, which started, alongside comedy, with the Greeks. I thought I'd take a moment today to write a journal which is probably long overdue. I believe there is a common misconception floating around that CVs are so busy, that when you send us DD Suggestions, or other messages, you are being a bother. Quite regularly the DD Suggestions I receive start with something along the lines of "I am sorry to bother you..." or "I know you are busy but.."
I'd like to assure you all that no suggestions you send, or any other type of contact made with me (or any other CV for that matter) is something to feel sorry or bad about (unless you are legitimately harassing us or something). Traditional Mixed Media is a wonderful subject, earlier today we read about combinig techniques which was a great lead into Mixed Media. Mixed media is simply as the name suggests, pieces created with more than one media. The options to mix and match different medias is endless and experimenting with mixed media is highly encouraged! I'd like to take a moment and talk about the Traditional Art Mixed Media gallery here on dA and what does or doesn't belong there. As discussed above, we now all know what Traditional Mixed Media is but I think it's important to also discuss what is not Traditional Mixed Media. Celebrating Diversity #24The idea behind the Celebrating Diversity Project is to share deviations out of our area of comfort and explore art we usually don't see. This time I wanted to show you some examples of a gallery I know many people don't know about: Stereoscopy. 2 almost identical images placed side by side. There are a few differences between the 2 so when you cross your eyes, you'll get the 3D effect. DDs: To select or not to selectHey wazaaaaaap! In my last journal I talked about my stance on Daily Deviations. In this occasion I'll tell you some of the reasons that make me choose some artworks, and the reasons that make me not choose others. Hopefully it will be interesting for some, useful for others or simply a good reading if you're really boring. What makes me choose a deviation to be featured? Such a simple question with such an indefinite answer, and I apologize in advance for giving such a vague response but I'll put it simple: Sometimes not even I know! It's Artist's Toolbox again! And it wouldn't be right if we skipped an article representing traditional media For today's topic I picked Pencil, probably the most traditional of them all. Even if you thought you already knew everything there is to know about pencils, give this article a shot, it might surprise you ! Besides pencils, I will describe Graphite sticks and probably my most favorite drawing tool, Charcoal. Final part of this article is a feature of very helpful Tutorials created by your fellow deviants, don't overlook Happy reading! There is something so unique and so humbling about Celtic art that we can immediately recognize it when we see it, though it is difficult to truly describe as a single 'medium'. With intricate designs, swirls, and beautiful knotwork however Celtic art is also a medium that you can recognize when you see it. Because Celtic art covers a huge expanse of time, geography and throughout various cultures, it can present some difficulty when trying to term or define what Celtic art truly is. Byzantium was the name given to the Eastern part of the Roman Empire. Known by many other names, such as Romania, it was born under the ruling of Diocletian when he divided the Roman Empire in two parts: Western and Eastern, in 286. It stretched roughly through the East of Italy, Greece and the Anatolian Peninsula – in some periods covering as far as the Northern coast of Africa and South Andalusia. It endured attacks from Barbarians, Sassanids, Persians, Arabs and Slavics until the famous falling of Constantinople in 1453. Lasting some 1000 years more than its twin Western Roman Empire, Byzantium retained and developed the Greco Latin heritage with some aspects of its own , and always dreamt of restoring the original universality of the (whole) Roman Empire. The history of Ancient Egypt, from its growth to its downfall, has been depicted through many means of art, such as sculptures of the ancient kings and the hieroglyphic scriptures. The major periods of Ancient Egypt are divided into the following: Early Egyptian, Old Kingdom, Middle Kingdom, New Kingdom, the Late Period, the Hellenistic Period, and the Roman Period. Hieronymus Bosch was a Flemish painter who was born in 1450 and buried on August 9, 1516. His birth name was Jeroen Anthoniszoon van Aken, but he changed his last name to Bosch after the last syllable of this birthplace, ‘s Hertogenbosch. He came from a family of artists; his father, uncle, and grandfather were all painters. However, Hieronymus Bosch was much more than a mere Renaissance artist with an interesting background – he was a master of using a brush to spread paint across a canvas. Bioillustrations has been around for years, but lately it's become more of a hot topic. Some universities have added degree programs in Bioillustration including University of Florida. Other universities have established programs such as Iowa State University, University of Toronto, John Hopkins University(whose medical and biological illustration program just celebrated it's 100th anniversary). What is Bioillustration? It is the illustration of biological concepts and principles. Bioillustration is all around you. Open a biology or medical textbook, all the diagrams and figures are bioillustration. Hatshepsut and Akhenaten: Diverse Rulers of EgyptOne of the oldest, long lived civilizations, Egypt has an extensive and intriguing history. Unfortunately, ancient Egyptian art can easily convince viewers otherwise as it often becomes tiresome looking at 3,000 years of Egyptian's repetitive art style. Several of Egypt’s rulers, however, managed to stand out against all of the similarity that is ancient Egyptian art. Hatshepsut and Akhenaten are two of the more diverse rulers ancient Egypt experienced. Both of their reigns produced different and interesting uses of art for their own political and religious purposes. Hatshepsut was the first female king in recorded history. As such, she had to work hard in order to legitimize her rule. She needed the people of Egypt to accept her as their leader. She took several approaches to this goal and managed to be quite the successful leader.